Ladder bars optioned up with a roof rack. Two styles available. 20mm x 20mm powder coated square tube steel or diameter 40mm full alloy. JUST A SAMPLE OF WHATS AVAILABLE. 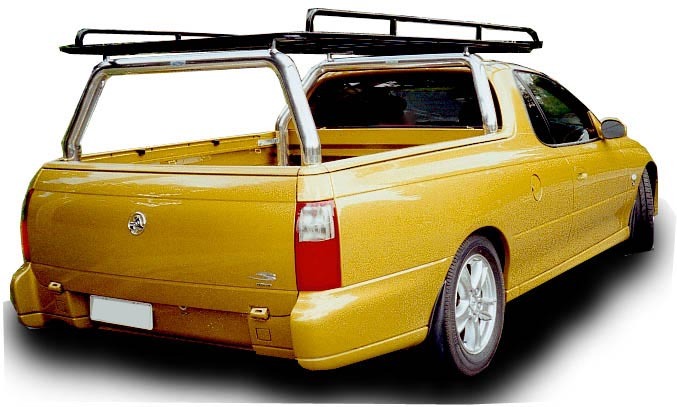 This FG Falcon genuine tray is fitted with 76mm mill finish (unpolished) alloy bars and a 3.0 x 1.36 (inside width) alloy roof rack made from diameter 40mm aluminium. A Volkswagen Amarok with 76mm polished bars and a 40mm diameter roof rack. A 2.1m rack as shown is best suited to all Dual Cabs. 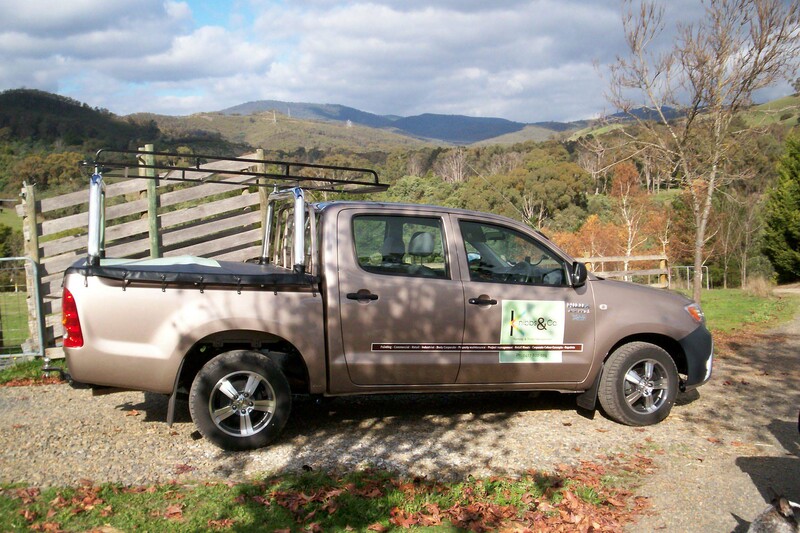 This BF Falcon Ute is fitted with 76mm polished alloy ladder bars and a 2.4m x 1.26m Full Alloy Roof Rack in 40mm diameter. These roof racks are built to last. The 40mm tube is 3mm thick and the mounting plates are 10mm thick. VZ Crewman shown with 76mm polished alloy front and rear ladder bars and optional 2.1m x 1.25 powder coated black roof rack fitted to a white Crewman ute. Ladder racks are available with or without roof racks. 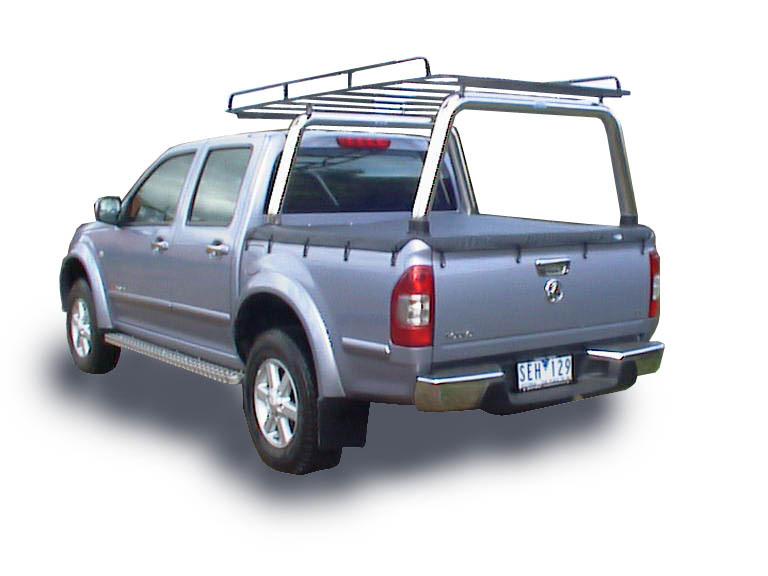 A D22 Navara with 76mm polished bars and a 40mm full alloy roof rack. A D40 Navara RX with a 2.4m powder coated steel roof rack on 76mm polished alloy ladder bars. 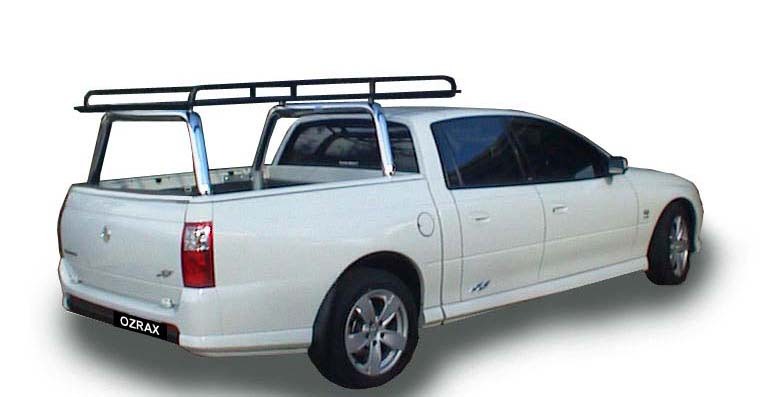 VU Commodore Ute shown with 76mm Polished Alloy Front and Rear Ladder Bars and Optional Powder Coated 2.4m x 1.25m Duragal Ladder Rack. Toyota Hilux shown with 76mm polished alloy Ladder Bars and optional 2.1m x 1.25m powder coated duragal rack. Look for this one around Wangaratta in Victoria. 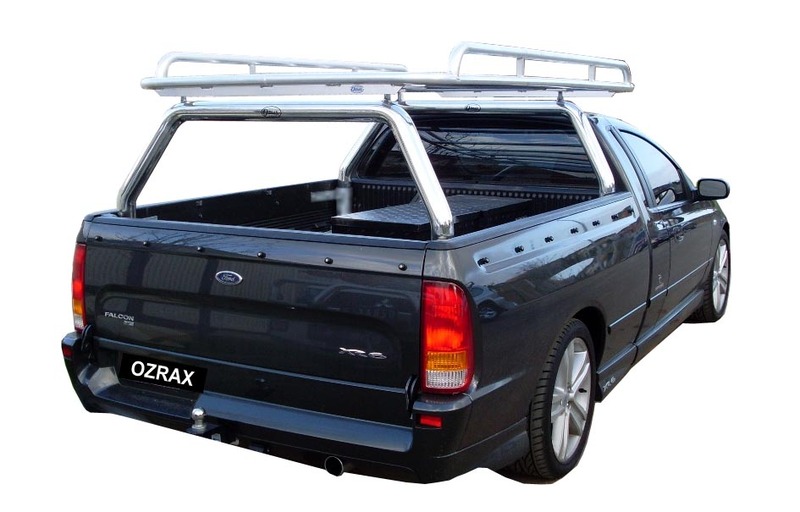 The popular RA Rodeo with a 20mm x 20mm square tube roof rack (2.1m x 1.26m) bolted to 76mm polished alloy bars. ML Triton fitted 76mm polished alloy bars and a 2.1 x 1.25 full alloy roof rack from diameter 40mm tube.